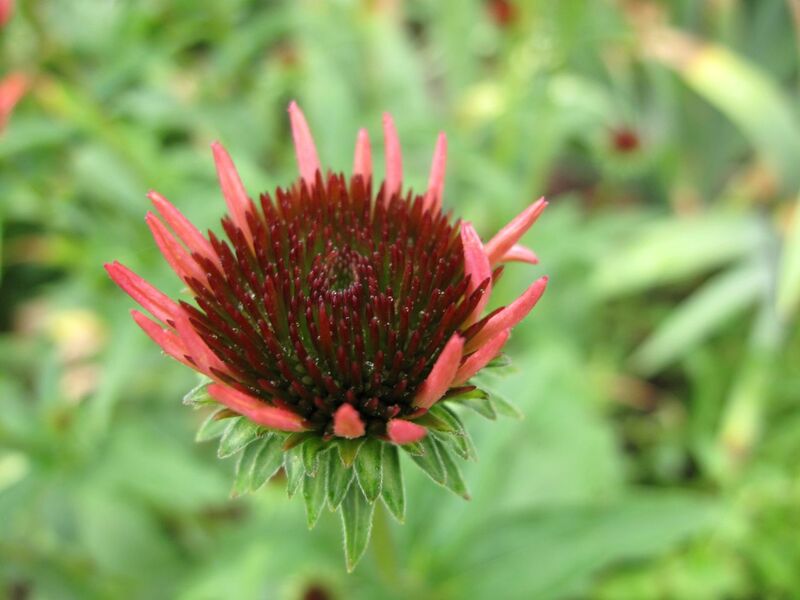 Echinacea are opening up all around the garden this week, mostly the species E. purpurea. 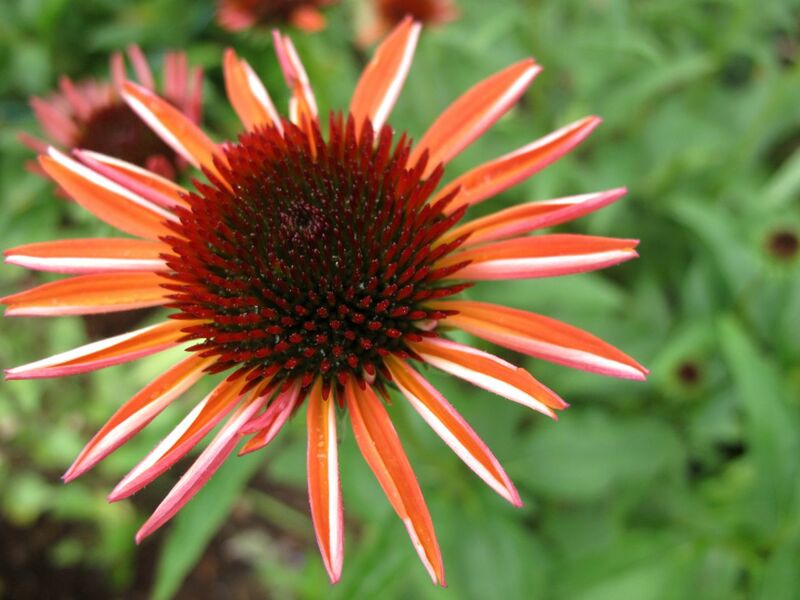 Echinacea ‘Big Sky Sundown’ is a hybrid coneflower with a rich red center. At first it seems to be all cone, but eventually petals emerge. 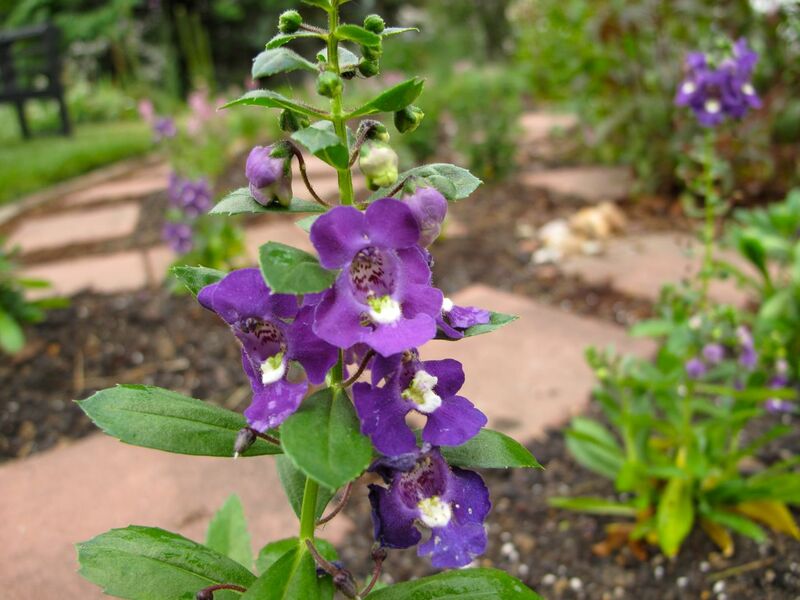 Over the past several weeks I have removed all the red snapdragons and most of the ‘Husker’s Red’ penstemon from the meditation circle and replanted it with annuals that should perform well through the summer. 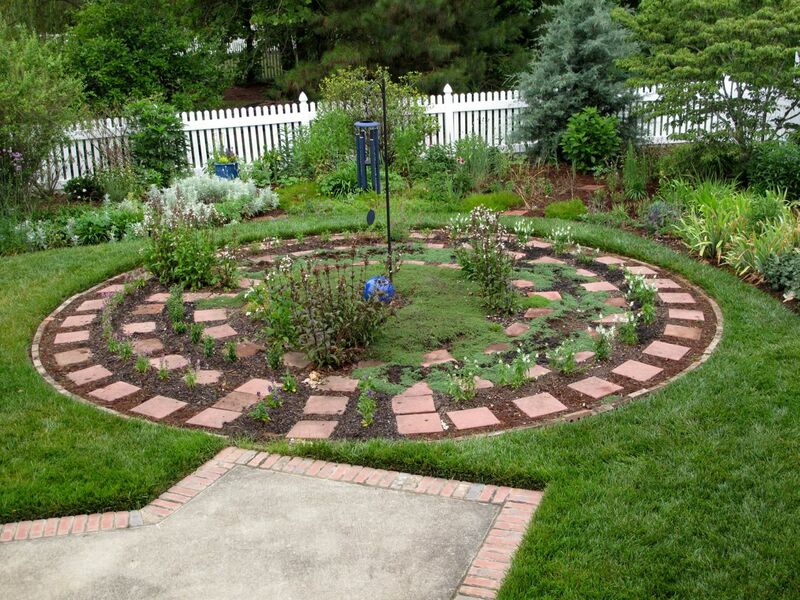 I was happy with the labyrinth this spring, its walls planted in taller, fuller plants, but stepping to the next stone became like navigating an obstacle course. 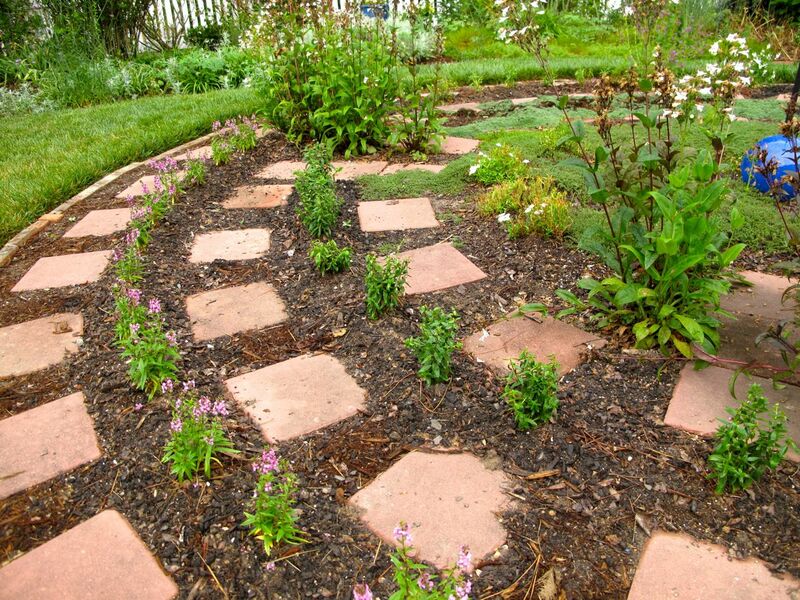 For the new simplified planting scheme I used several shades of Angelonia (Summer snapdragon) to add color without blocking the path. I wanted blue and white, but when I was ready to buy the blue plants were scarce. 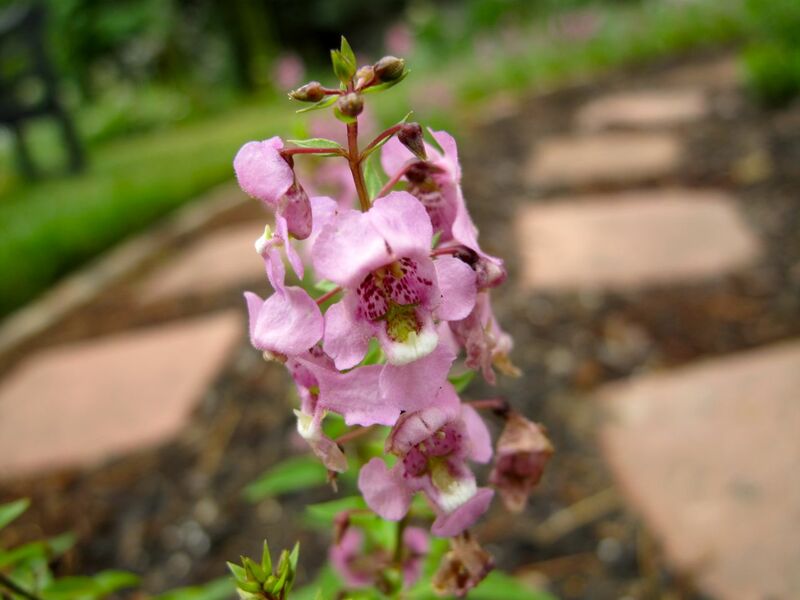 From the penstemon at 11 o’clock around clockwise to 5 o’clock I used Angelonia ‘Serena White’. With the hot dry weather in May, it was difficult to get these established, and I had to break my rule and water nearly every day in the month. We finally had a little rain yesterday and today is overcast, a welcome reprieve. To complete the plantings on the other side, I used Angelonia ‘Lavender’ (in bloom on the far left path) and Angelonia ‘Raspberry’ on the interior path (not blooming yet). I could not resist slipping in another gardenia to show. 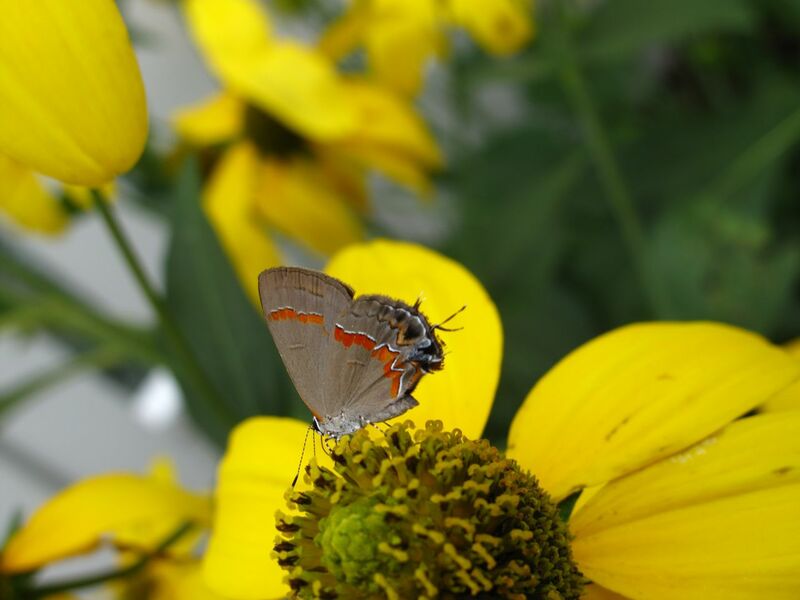 A single flower of ‘August Beauty’ is blooming for the first time. Three of five bushes survive that were planted in August 2012. 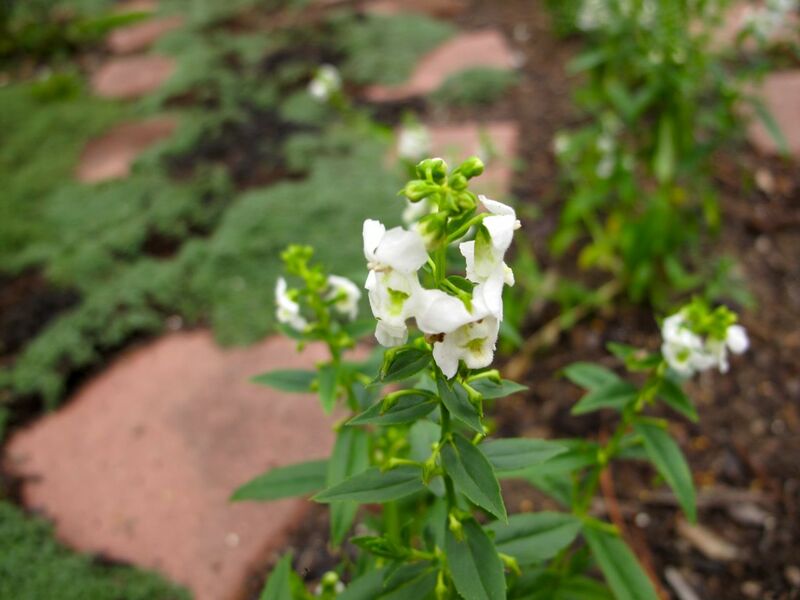 This entry was posted in garden and tagged angelonia, August Beauty, gardenia jasminoides, meditation circle, meditation garden, meditation path, pass-along plant on June 3, 2015 by pbmgarden. Garden Bloggers Foliage Day (GBFD) crept up on me this month. We had snow last night but well before midnight it had stopped and the ground was still green, so there are no snow pictures today. Deep cold has settled in for the next few days. 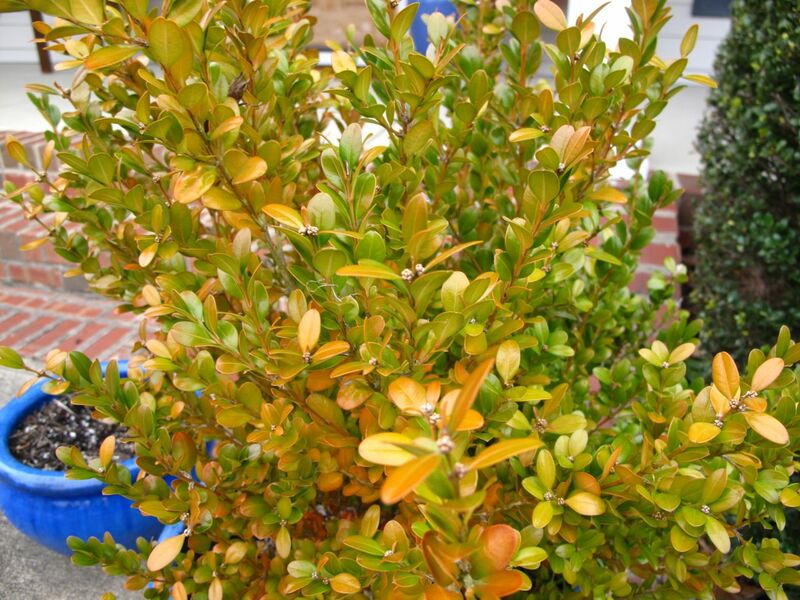 For several years a pair of Wintergreen boxwood have been growing in large blue pots by the front steps and I think it is time to transplant them to the garden. 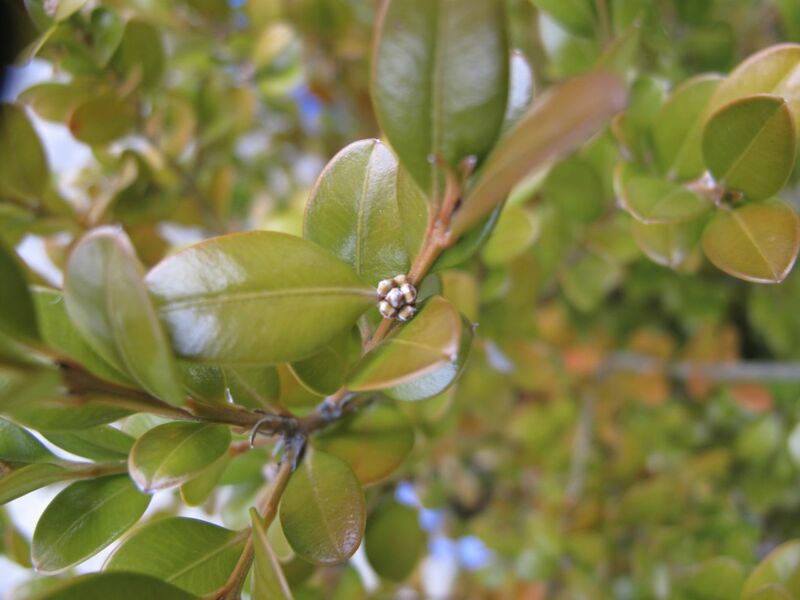 These shrubs were labeled Buxus microphylla var koreana ‘Wintergreen’ but I came across information today that indicates that name has been replaced with Buxus sinica var. 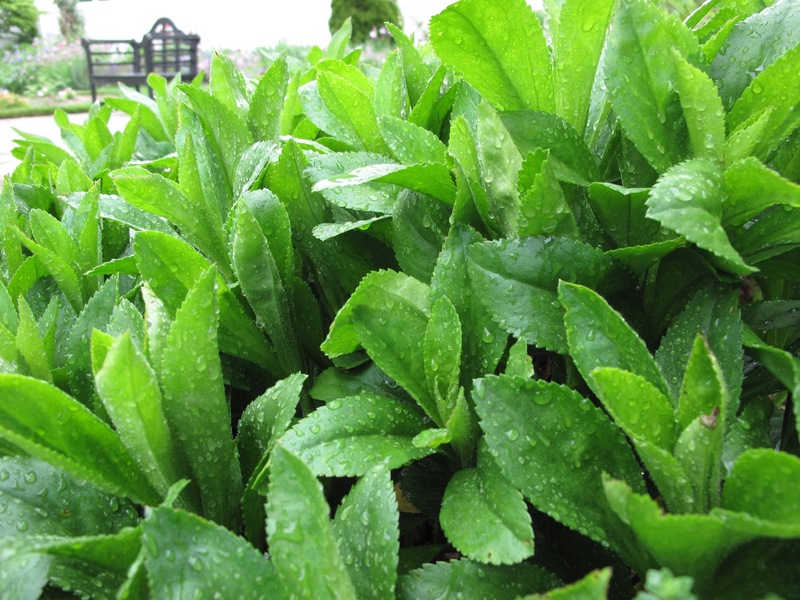 insularis ‘Wintergreen’. 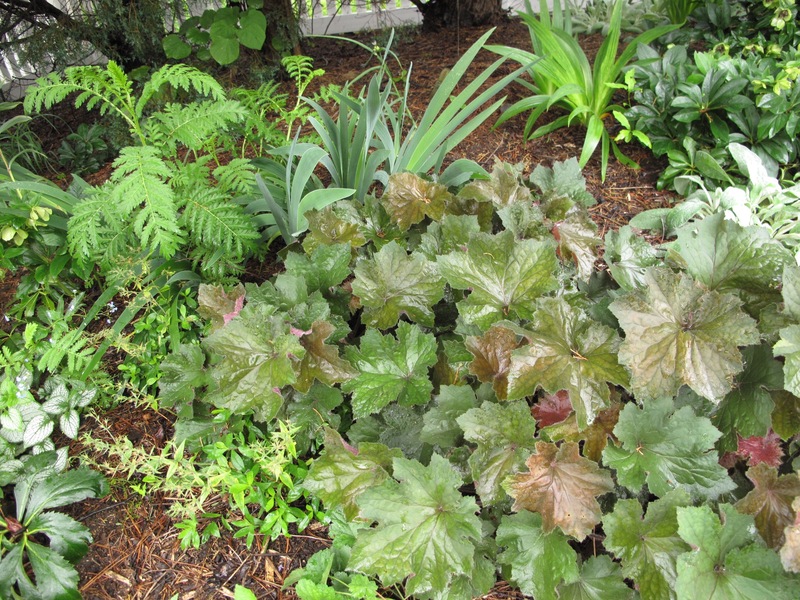 Would it be useful to have an app that notifies us when the names of our plants change? 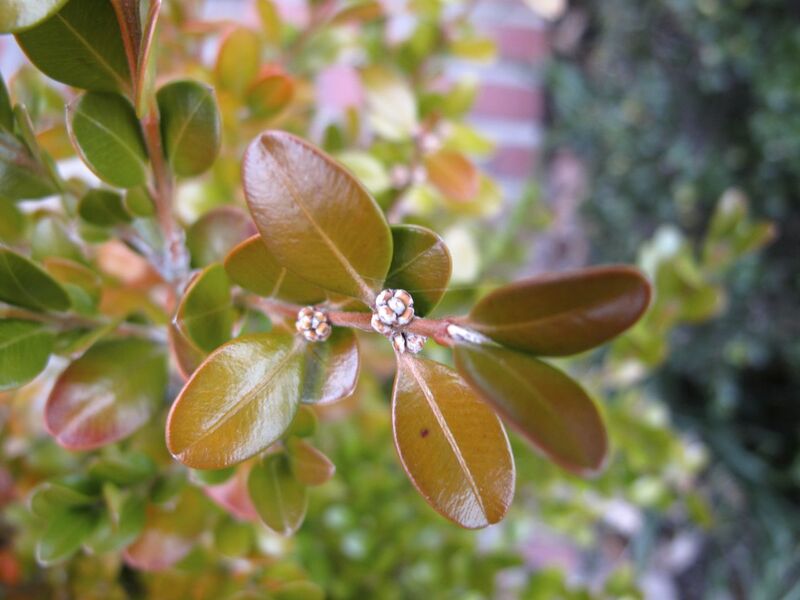 These boxwoods have formed buds and the eventual flowers are supposed to be insignificant but fragrant. I do not remember them blooming last year. 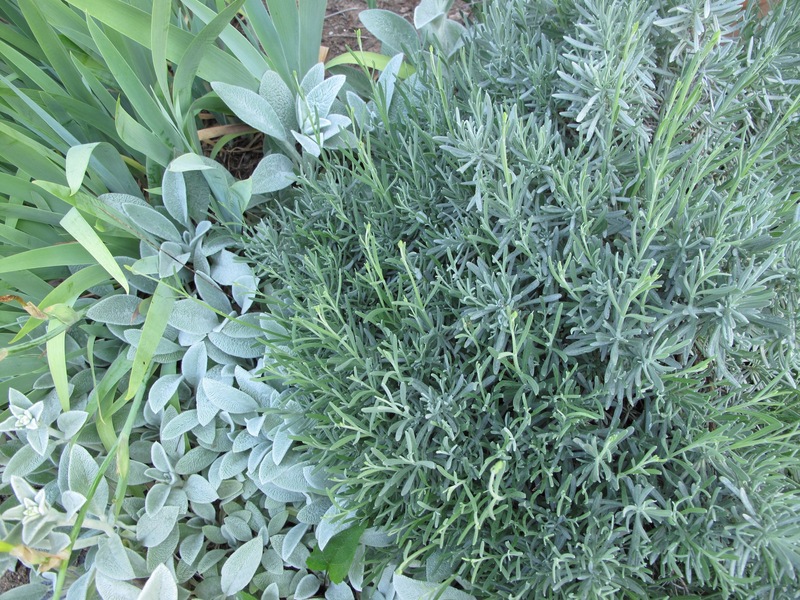 These shrubs have a loose, open habit which I like, but they can be tightly sheared and shaped as well. 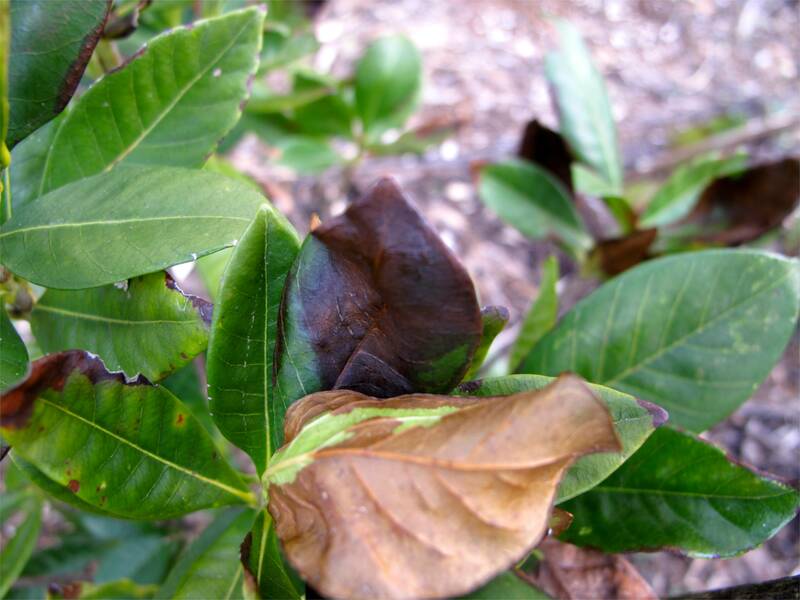 The leaf color is quite bronze during the winter, a deep green at other times of the year. 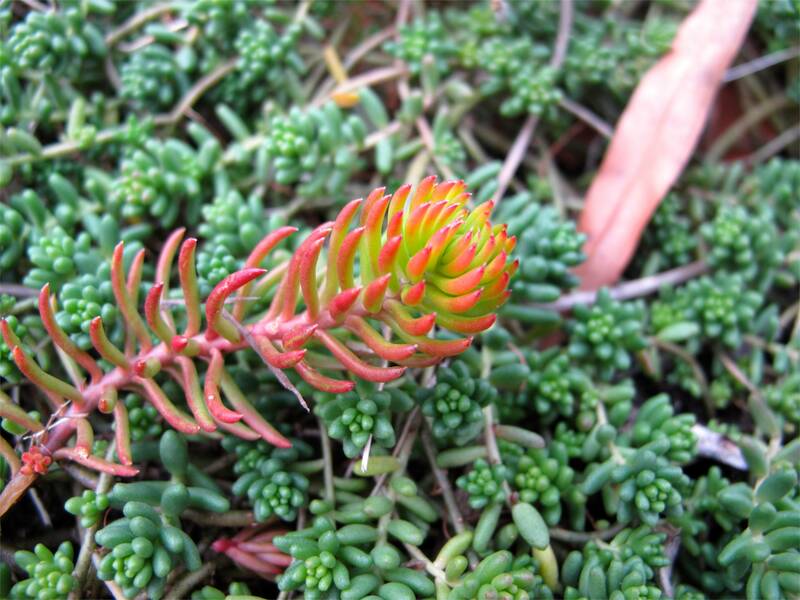 Elsewhere a small pot of mixed sedum purchased a couple of years ago has spilled out and spread into an interesting ground cover. 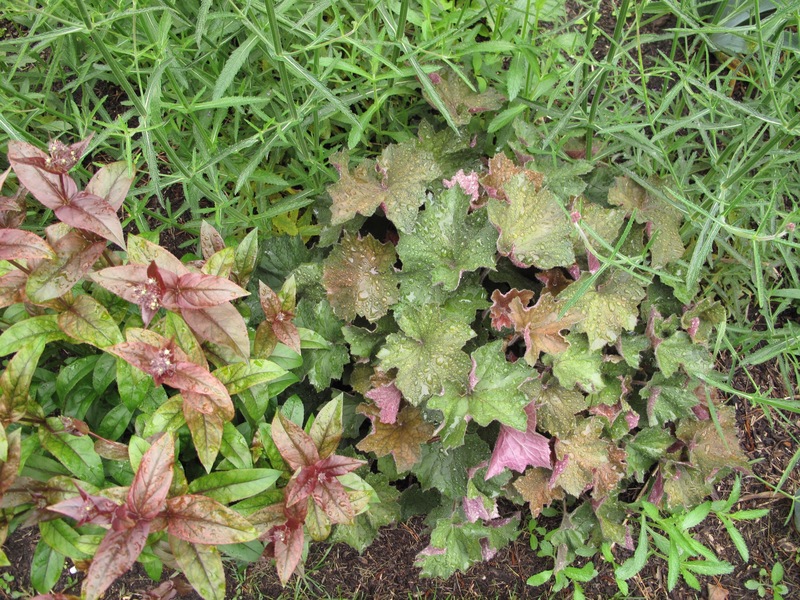 These seem tolerant of winter temperatures that have reached down into the ‘teens. Five new gardenias were planted a year and a half ago in the heat of August, all appropriately named ‘August Beauty’. The expectation is these will grow into a 5-foot tall evergreen hedge to screen the air conditioner units located next to the northeast corner of the house. 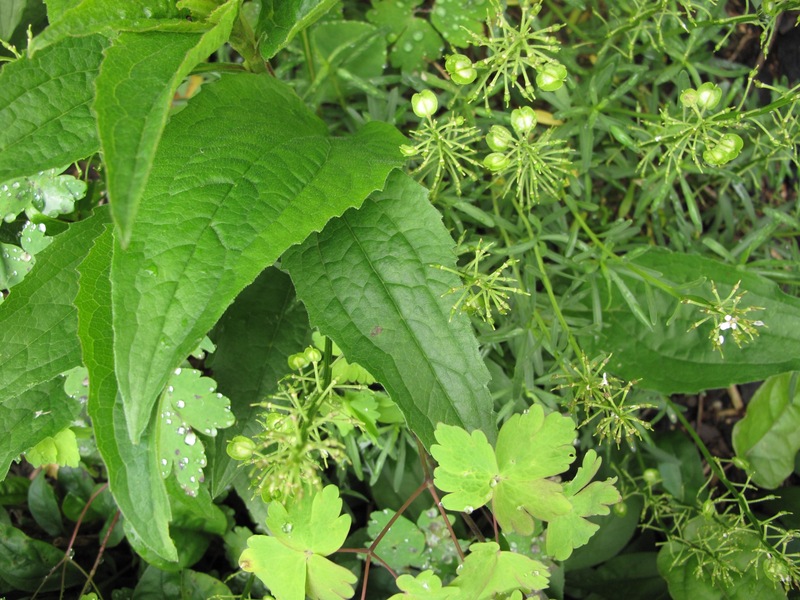 During the past summer they filled out slightly, gained a couple of inches in height and looked healthy and green. These gardenias are hardy to zones 8-11 and some sources list zones 7-11, which is good because pbmGarden is in planting zone 7b. There has been some damage to a few leaves but I am optimistic the shrubs will survive the cold weather. This garden is definitely designed with spring in mind, so to show it in its wintry garb is to lay it out bare and unprotected. 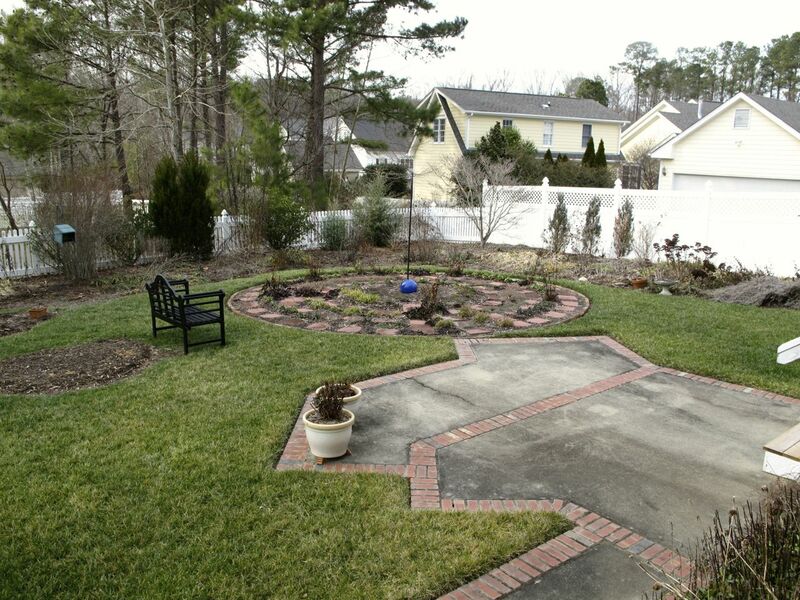 My tendency is to want to show carefully posed images that present the best features of the garden. Winter though imposes a hard dose of reality. The sparseness makes the garden look lonely and in retreat. The grass is green though and a few evergreens enliven the view. If the various trees could speak they might explain what happened to their planned, but long-lost partners—which drought year, poor pruning decision, or other problem doomed these survivors to try their best to stand tall and go it alone in a spotty arrangement. With objective eyes I see the awkwardness, the unrealized potential and I readily acknowledge winter brings a good opportunity to examine the structure of the garden and make plans. But looking down on the garden this morning with my subjective eyes, I notice a special, if imperfect, place. Three bluebirds line up ready to make their moves toward the feeder. Red cardinals flit in and out of the bare spirea branches and chickadees, Carolina wrens, towhees and many other birds find momentary shelter in the brown, stalky remnants of the previous season as they forage for food or await a turn at the feeder. The sun spreads through the garden as it rises, highlighting portions until finally enveloping it all in the best warm glow it can muster on this frigid day. And I find walking along the meditation path in winter brings a particular clarity and peacefulness. So on this Foliage Day I must remind myself it is ok to just be content. There will always be space for improvement in this garden, but already it is a good place and happy one, even in its winter clothes. Thanks to Christina for hosting GBFD on the 22nd of each month. Visit her at Garden of the Hesperides to discover what foliage displays she and other garden bloggers are featuring today. 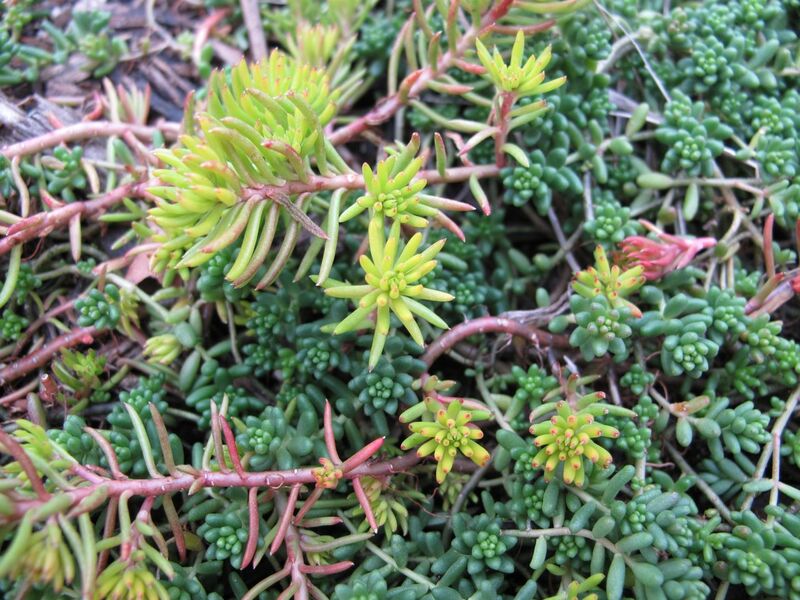 This entry was posted in garden and tagged August Beauty, foliage, Garden Bloggers Foliage Day, GBFD, Mixed Sedum, winter garden, Wintergreen boxwood on January 22, 2014 by pbmgarden. 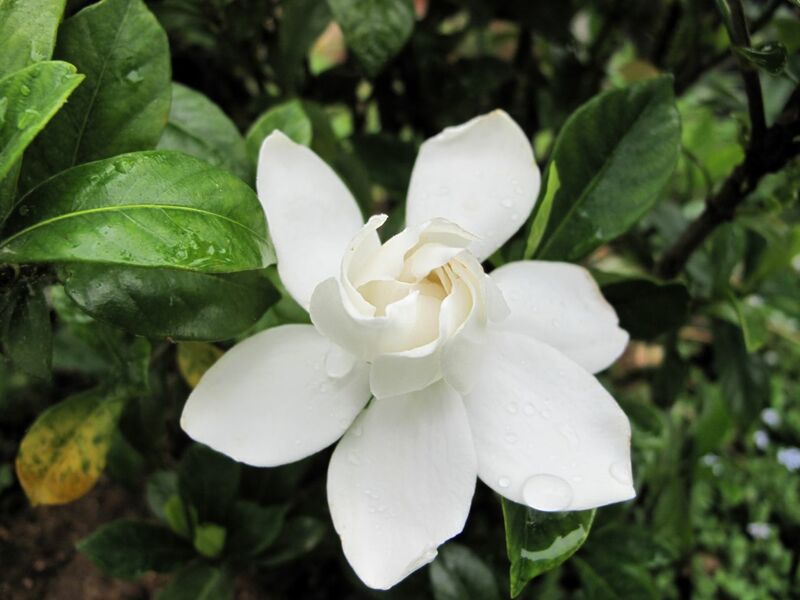 Today I purchased five gardenias named ‘August Beauty’ to screen heating and air conditioning units near the house’s foundation. I am unfamiliar with this variety, but the price was irresistible. 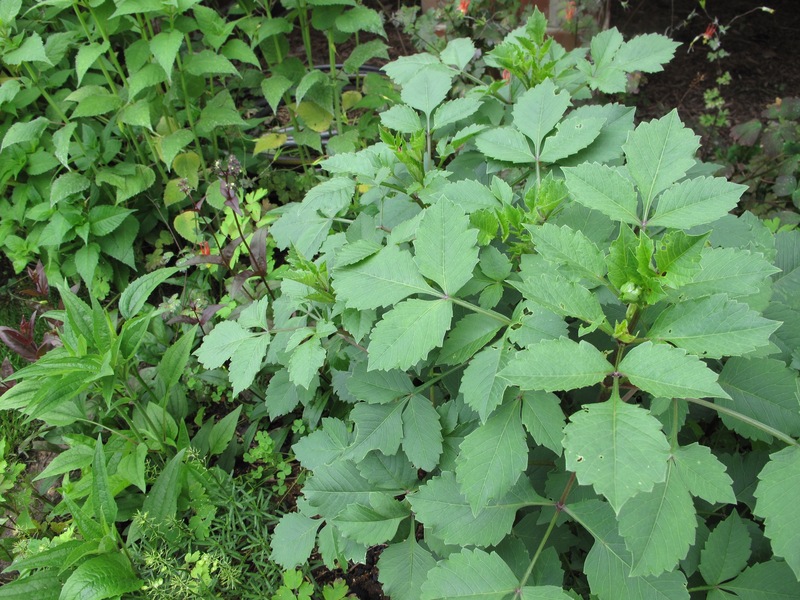 These plants are tiny, but should fill in quickly, reaching 5 feet tall and 3 feet wide. 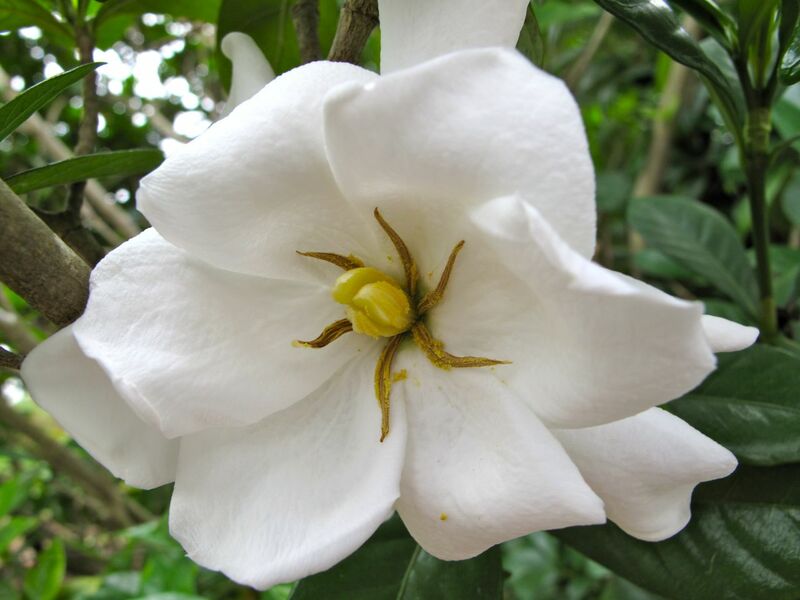 Meanwhile, well-established, ten-year-old gardenias perfume the garden. Well-watered from generous rains during most of this year, ‘Chuck Hayes’ Gardenias along the western border bloomed magnificently in late May. They have flowered occasionally since, but recently there has been a flurry of sweet-smelling blossoms. The hardy ‘Chuck Hayes’ is a good variety for this region as it resists cold and tolerates warmer temperatures. 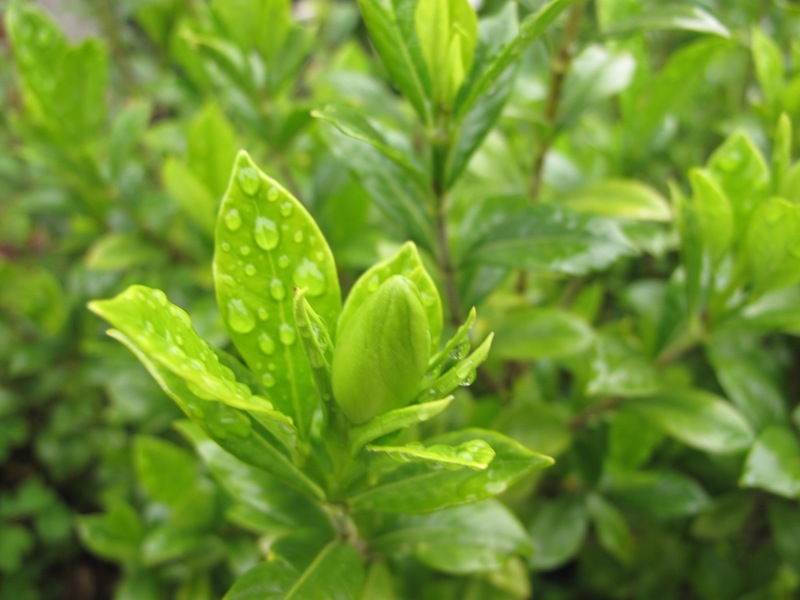 This compact evergreen shrub, 4-5 feet high, features leaves that are dark green and glossy. 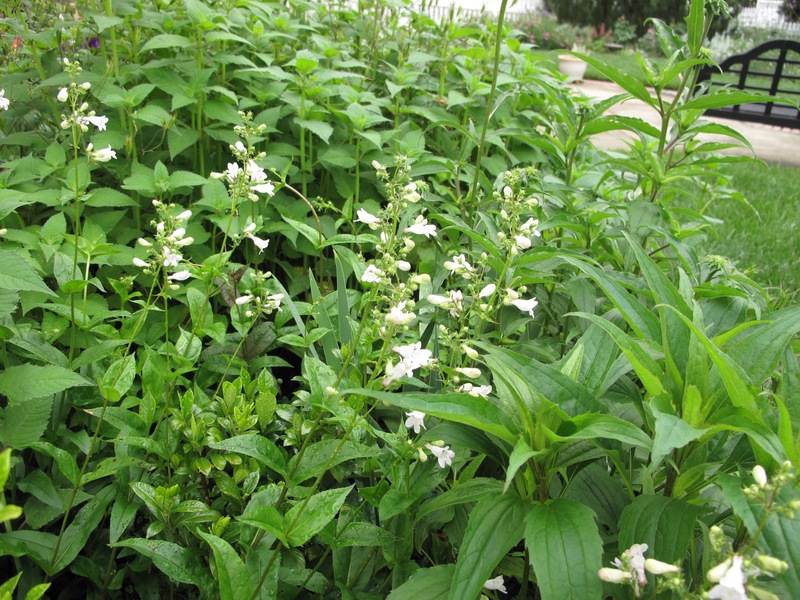 Flowers are double, velvety white and highly fragrant. 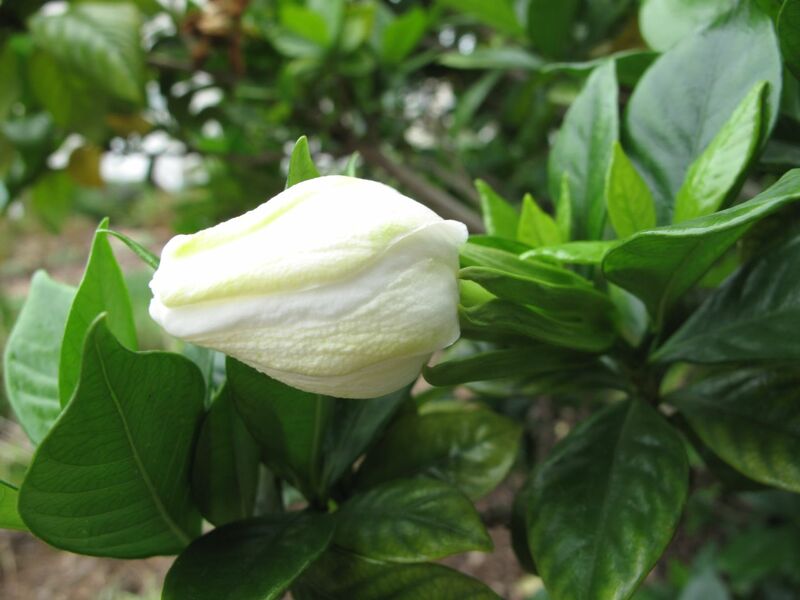 Mr. Charles “Chuck” Hayes, who developed this gardenia, was from Kitty Hawk, North Carolina. Elsewhere today Rudbeckia hirta ‘Irish Eyes’ drew a myriad of visitors, including this lovely one. I am not sure what it is (anyone?) 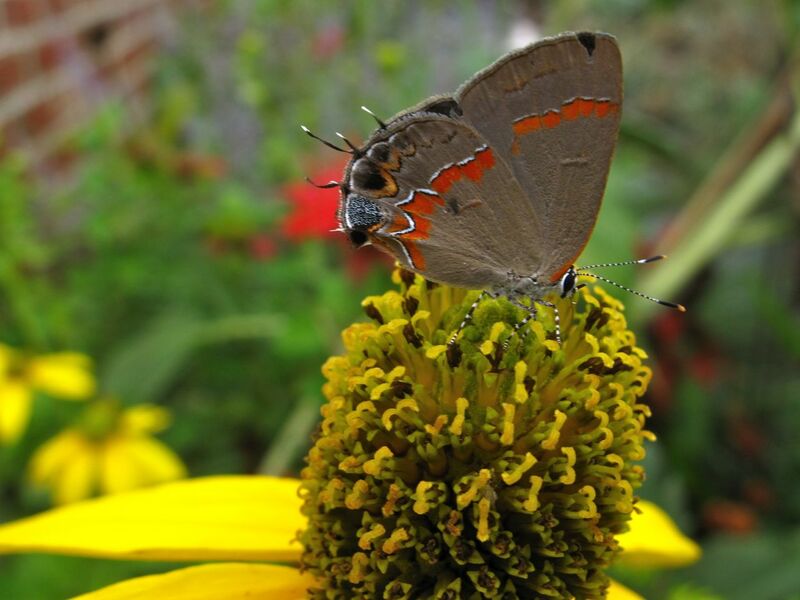 but This butterfly is a Red-banded Hairstreak (Calycopis cecrops). [Thanks to P&B for the identification!] I enjoyed the way the Monarda in the background echoes the scarlet in this creature’s wing. This entry was posted in garden and tagged August Beauty, Chuck Hayes, gardenia, gardenias, nature photography, photographing nature on August 24, 2012 by pbmgarden.